Krishna story: Dog of Sivananda receive mercy by secret wepon! Sri Caitanya Mahaprabhu was living in Puri during His later days and every year there would be a big gathering in Puri with a large group of devotees from Bengal traveling there to take darshan of the Lord. Sivananda Sena, an exalted devotee living in Bengal usually made the arrangements for the journey. He maintained everyone and provided residential quarters. While going to Jagannatha Puri, Sivananda Sena allowed a dog to go with him. He supplied it food to eat and maintained it. Sivananda Sena, unhappy that the dog had to stay behind, paid the boatman ten pana of conchshells to take the dog across the river. One day while Sivananda was detained by a tollman, his servant forgot to give the dog its food. At night, when Sivananda Sena returned and was taking his meal, he inquired from the servant whether the dog had gotten its meals. When he learned that the dog had not been supplied food in his absence, he was very unhappy. He then immediately sent ten men to find the dog. When the men returned without success, Sivananda Sena became very unhappy and fasted for the night. In the morning they looked for the dog, but it could not be found anywhere. All the Vaishnavas were astonished. And the next morning all the devotees came to see the Lord. When all the devotees came to the place of Sri Caitanya Mahaprabhu, they saw the same dog sitting a little apart from the Lord. Furthermore, Sri Caitanya Mahaprabhu was throwing remnants of green coconut pulp to the dog. Seeing the dog eating the green coconut pulp and chanting “Krsna, Krsna” again and again, all the devotees present were very surprised. When he saw the dog sitting in that way and chanting the name of Krsna, Sivananda, because of his natural humility, immediately offered his obeisances to the dog just to counteract his offenses to it. The next day, no one saw that dog, for it had obtained its spiritual body and departed for Vaikuntha, the spiritual kingdom. Such are the transcendental pastimes of Sri Caitanya Mahaprabhu, the son of mother Saci. He even delivered a dog simply by inducing it to chant the maha-mantra, Hare Krsna. “This is the result of sadhu-sanga consequent association with Sri Caitanya Mahaprabhu and promotion back home, back to Godhead. This result is possible even for a dog, by the mercy of the Vaishnava. Therefore, everyone in the human form of life should be induced to associate with devotees. By rendering a little service, even by eating prasadam, what to speak of chanting and dancing, everyone can be promoted to Vaikunthaloka. It is therefore requested that all our devotees in the ISKCON community become pure Vaishnavas, so that by their mercy all the people of the world will be transferred to Vaikunthaloka, even without their knowledge. Everyone should be given a chance to take prasadam and thus be induced to chant the holy names Hare Krsna and also dance in ecstasy. One of the important points to understand from this pastime is how we should treat the living entities. Many times we are neglectful and lack compassion or respect for the living entities when it comes to feeding them prasadam. It results from our lack of faith in the potency of Prasadam that it will cleanse all the contamination from the hearts of the living entities. Sri Sivananda Sena treated even a dog with so much respect, then what to speak of human beings ? In this Kali yuga, living entities are predominantly in the modes of passion and ignorance. Whereas to understand the Supreme Personality of Godhead and perform devotional service, the bare minimum requirement is to be at least in the mode of goodness. So how to build the bridge between the two sides ? The only solution is “Prasadam”. Because the potency of prasadam is to soften and cleanse the heart of a person even without his knowledge, thereby bringing him to the platform of sattva guna. At that stage, he is ready to receive the message of transcendence. There are unlimited examples in the history of bhakti cult in this regard. 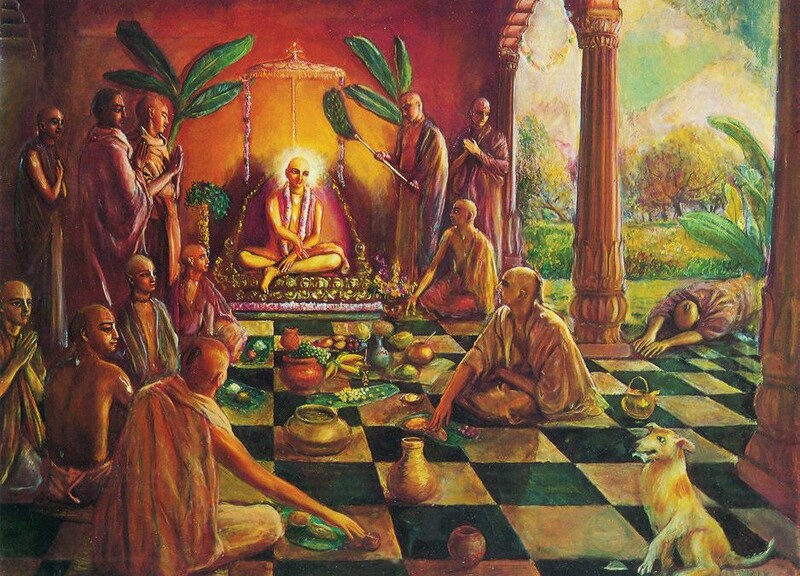 Srila Prabhupada is the greatest exponent of Prasadam distribution. At first, when he started the Krishna Consciousness movement in the western world, he did not impose any rules and regulations. All those who came were drunkards, drug addicts and hippies. All he did was feed them with prasadam and sing kirtans. Moreover once the feast was over, they would leave the plates and cups as it is. After everyone had left, Srila Prabhupada would clean all the plates, utensils and the entire room by himself. A few years later as the movement spread all over the world, once several devotees had gathered in his room for his darshan. At that time, Srila Prabhupada went around each one of them in the room, pointing at them asking, “How did you come to Krishna consciousness ?”. By the time he reached the last person, every single devotee in the room had given the same answer – “PRASADAM!”.